SDB bank once again being recognised for its invaluable contribution towards the upliftment and development of the MSME sector, with the latest award it received as the ‘Fastest Growing MSME Bank in Sri Lanka’ for the year 2018, by the leading UK based publication, Global Banking and Finance Review. The award joins a rank of accolades garnered by SDB over the years in its growth journey to be the critical component in the local banking sector that it is today. Last year, Asia Securities in its financial review commended the SDB for its unique positioning servicing the unbanked rural economy by leveraging the bank’s access to co-operatives. The review further commended the SDB operation for maintaining the lowest OPEX per branch in the scope of its review and for its unconventional banking model focused on retired Government employees and MSMEs. 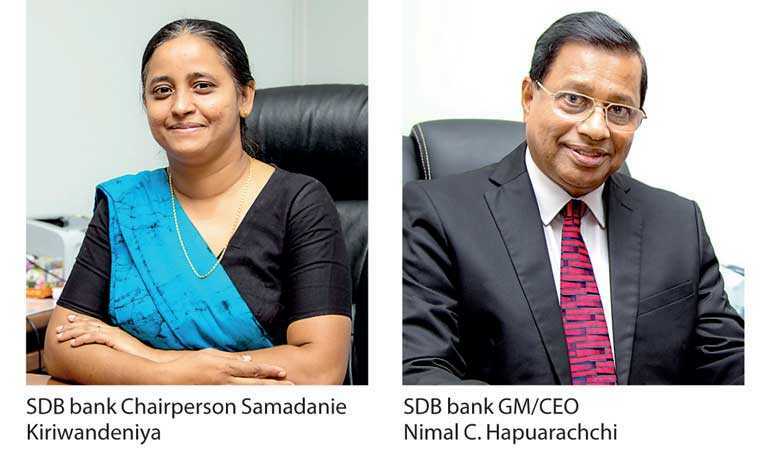 A specialised bank licensed by the Central Bank of Sri Lanka, SDB bank has been consistent in its efforts towards the empowerment of the MSME segment, which the bank in line with many global authorities has identified to be the backbone of the economy. It is in this context that the SDB has granted in excess of 54,000 loans in the financial years of 2016 and 2017. The accumulative monetary value of loans handed out to this critical economic segment is nearly Rs. 24 billion as it stands presently. Additionally, the bank has played an unparalleled role in developing co-operative businesses into MSMEs, spanning through a wide range of industries including, agriculture, dairy, garment and manufacturing. It has also facilitated co-operatives and MSMEs to scale up, by assisting them in developing their financial literacy, capacity building and value chain development by providing them with information about resource planning and management of challenges associated with scaling up, more so, in the context of the transformational shifts taking place in global commerce due to rapid changes in technology and a dynamic geo-political and regulatory environment. In line with this vision SDB has assisted co-operatives to gain easy access to finances through society networks, in order for them to scale up to MSMEs, with SDB having ties with nearly 3,800 societies to date and offering inclusive financing options which are unique and easily accessible, even for individuals and co-operatives engaged in informal segments of business.